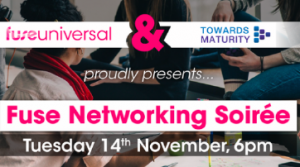 The Fuse Networking Soirée will connect over 300 professionals from across the learning and development industry. The event will provide the attendees with an outstanding business networking experience and the opportunity to hear the latest in the industry from world recognised thought leaders. This edition the Soirèe is co-hosted by Fuse Universal and Towards Maturity. Towards Maturity is an independent benchmark research providing the world’s largest evidence base on what works in learning. The aim of the evening is to provide the insider view of the learner's (from director through to apprentice) about what motivates them to learn at work and to use that 'undercover knowledge' to connect and engage with them. What's holding them back or winds them up? Furthermore, during the evening, Steve Dineen, exclusively for the evening will present Fuse product roadmap built to engage even deeper with learners and to continue to drive performance. During this session, Steve will also unveil the highly anticipated next-gen learning app and how it has been designed to further democratise corporate learning. Don't miss this unique event - register here.